Do not underestimate Ohio. I did. It has some world class natural beauty. And today I passed through the heart of it. 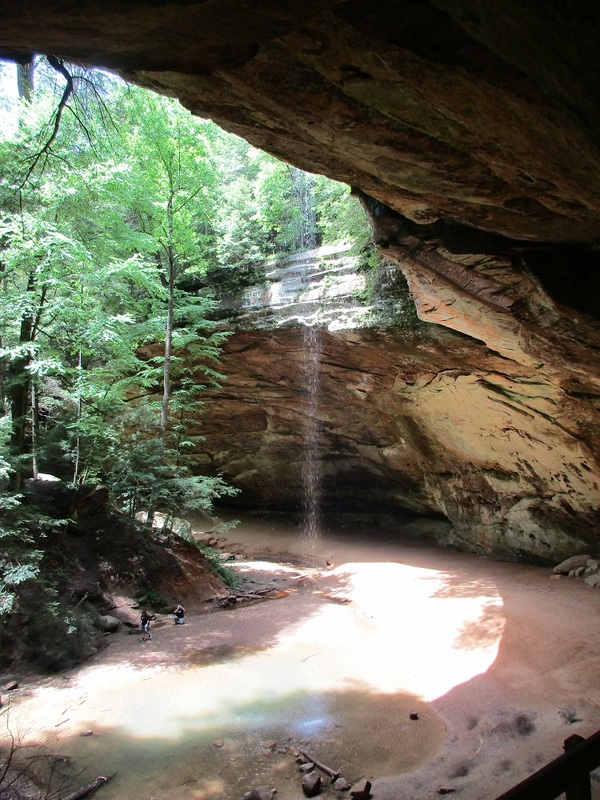 According to the girl helping me at the park office, the Hocking Hills area is Ohio's best. 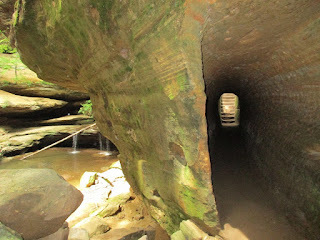 This area boasts more big sandstone rock shelters (natural cliff dwellings) than anywhere else in the east. It even has slot canyons. 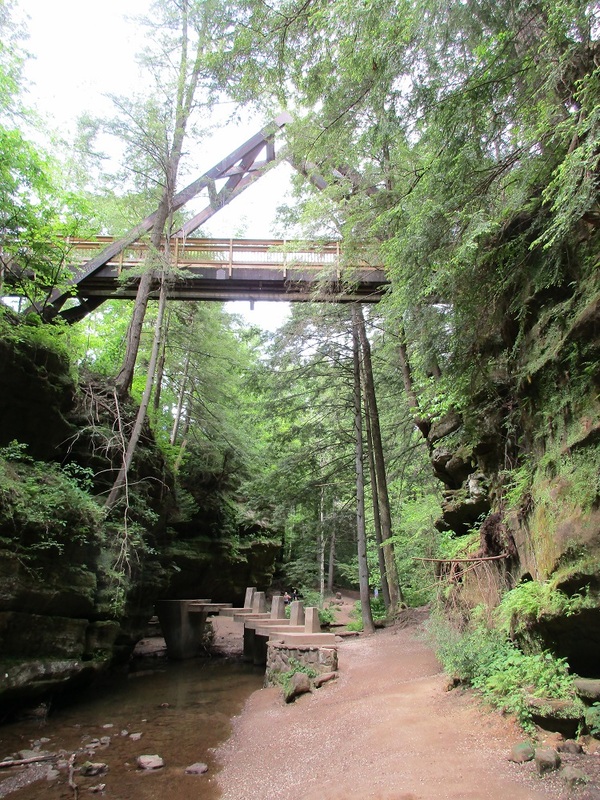 It's like Utah with forests, though I don't know of any natural arches here. If you're a particular fan of 'walk-behind' waterfalls, as I am, then this is the go-to place in the east, if not the entire country. There is a greater concentration of them here than anywhere else I know about. The biggest rock shelter in Ohio is Ash Cave, shown in the photo up top. Stunningly it combines the best walk-behind waterfall of the many I've seen. None other comes close. 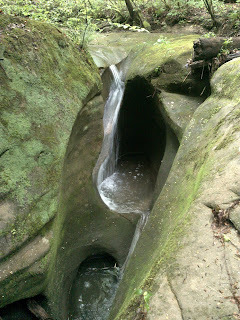 Because of that combination of world-class rock shelter and exceptional waterfall, Ash Cave stands alone. It is a natural wonder unlike any other, by my estimation. It is hard to do justice to a place like this in a 2-D photograph, but the one above was my best attempt. I've been to Mesa Verde in SW Colorado. 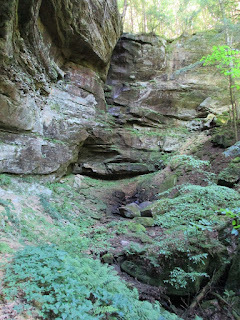 Ash Cave is every bit as cavernous as 'Cliff Palace' in terms of height and depth of the enclosure. Obviously it lacks the dwellings, but in their place it has its own walk-in shower. Live here and you don't need to haul water up from some distant stream. 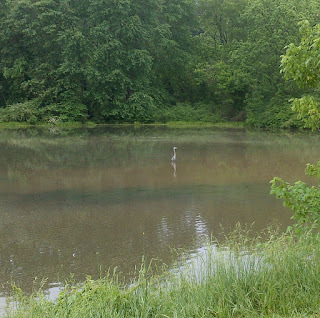 And of course it has the lush, verdant, hardwood forest vegetation. 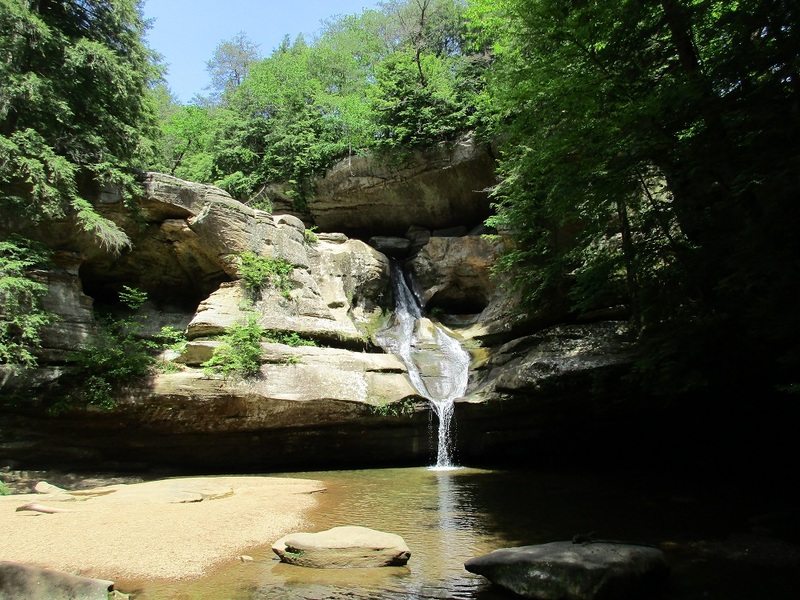 The 5.3 miles of Buckeye Trail through Hocking Hills was dedicated by and named for Emma Gatewood, a native to southeastern Ohio, famous for her 1955 thru-hike of the Appalachian Trail wearing Keds and carrying her gear in a home-made denim sack slung over her shoulder. 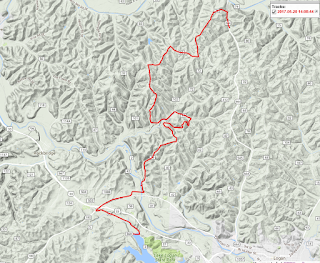 Her namesake trail is extremely heavily used, in sharp contrast to most of the rest of the Buckeye Trail. 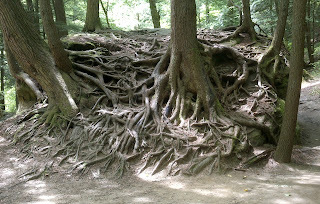 In the Old Man's Cave area creative trail building has perhaps reached its epitome. I know of no other long-distance trail in the country that can boast a dedicated, foot-traffic-only man-made tunnel. Besides rock shelters the Grandma Gatewood Trail features some fine waterfalls, best of which is Cedar Falls. As far as walk-behind falls, the trail goes under this one, just a small stream but a very tall fall. 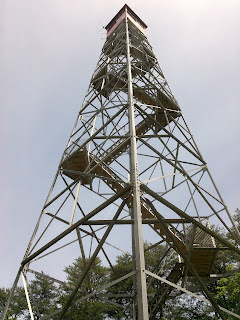 In the middle, the trail also comes up on a ridge and passes a fire tower, built in the 1930's, that you can climb. The view is of nothing but flat-seeming forest--no mountain ranges, no lakes, no grand vista, nothing but trees. So I haven't bothered to show it. 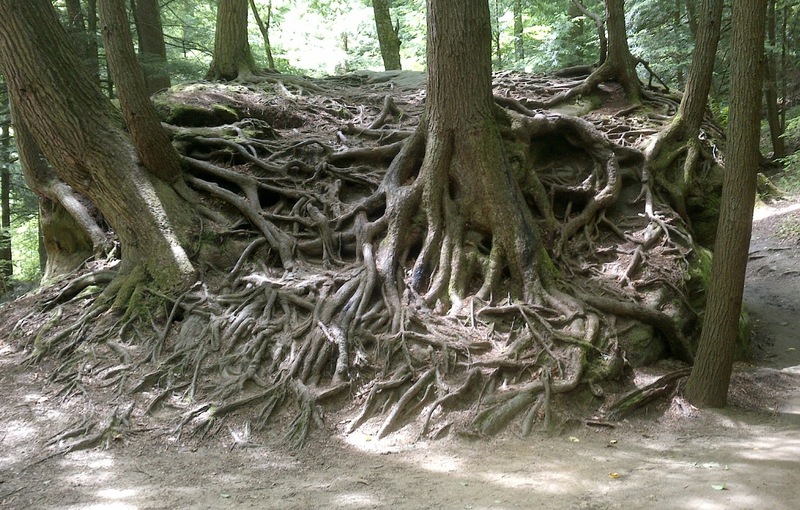 Instead I'll show a peculiar root-smothered boulder. 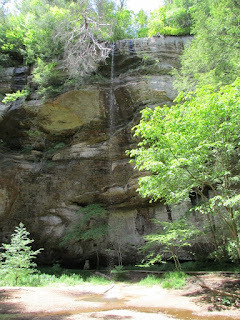 And of-course, one was rarely out of sight of the ubiquitous sandstone cliffs and buttresses. 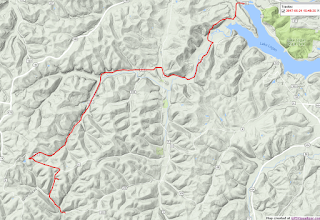 Outside of Hocking Hills State Park proper, there are half a dozen more fine trail miles in Hocking State Forest. 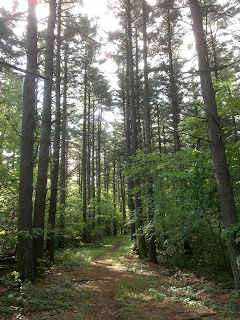 Here I passed through a stately pine plantation. I took a side trip to see a secret grotto with another lofty walk-behind fall, though it was just a splattering trickle on this day. The semi-rare pink lady slippers were in bloom. 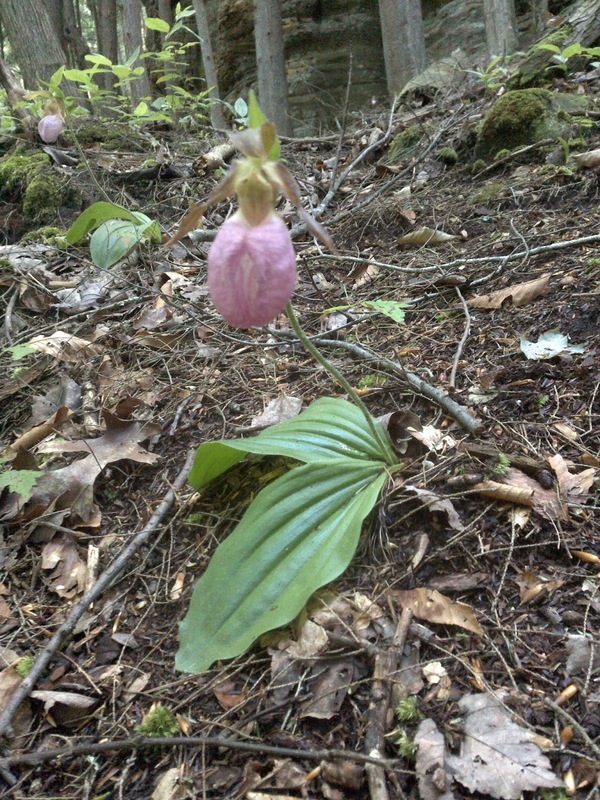 They're a wild orchid. 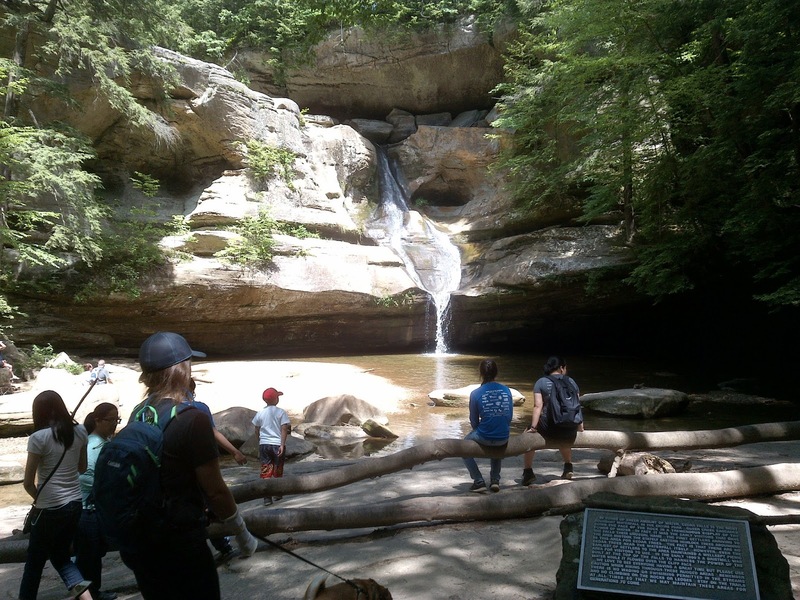 Weather was ideal for experiencing this natural beauty, and crowds were relatively modest in the busy area. That means you could usually get shots without people in them if you wanted to, although the throngs were definitely there--witness the wider shot at Cedar Falls. 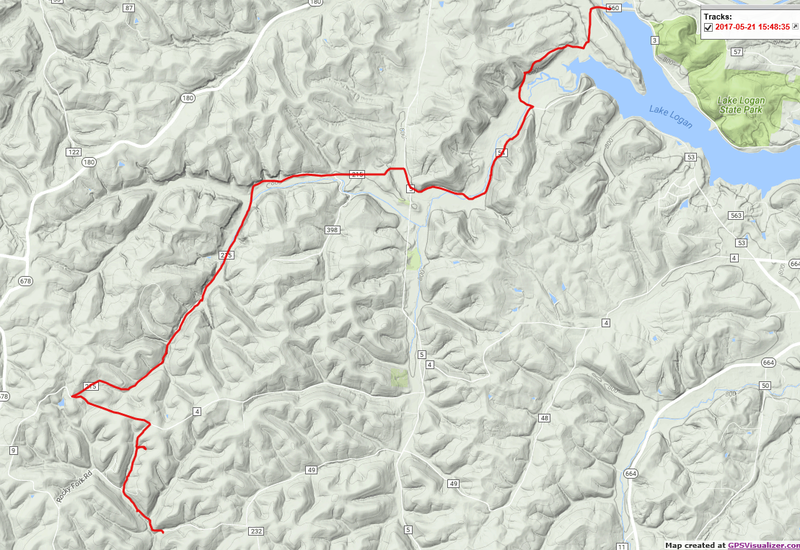 Anyhow, it was a day that is going to be hard to beat as I continue down the Buckeye Trail. But maybe, just maybe, there are more surprises in store. There were two days of hiking that got me to Hocking Hills including the Bill Miller Trail around Logan Lake. On the evening of the first of those days, back in my motel at sunset, I was treated to a first-class rainbow. 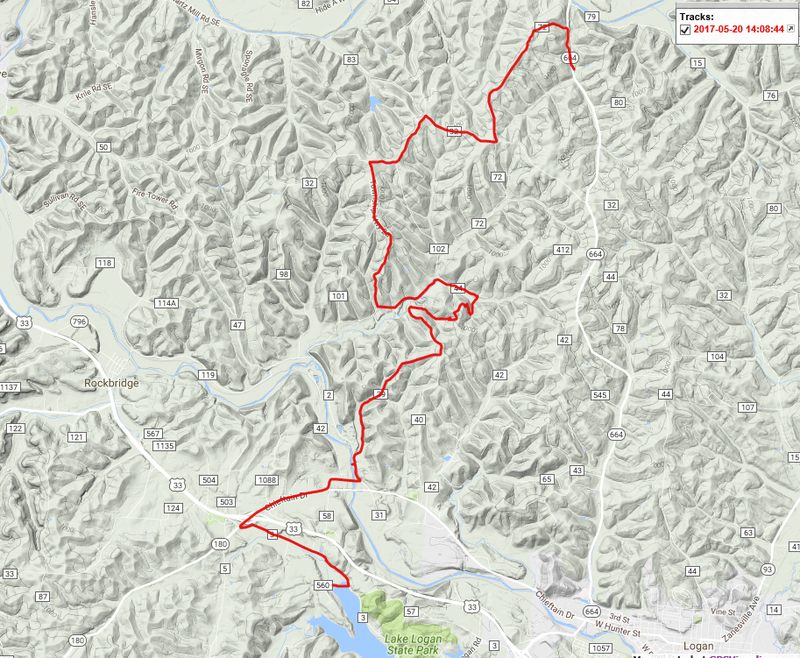 Here are the GPS screen shots of the tracks for those two approach days and the day in Hocking Hills. 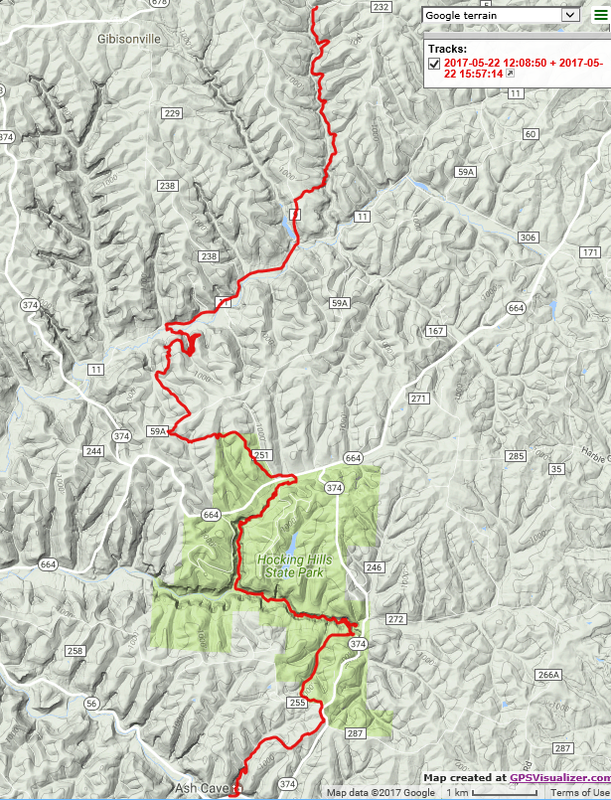 Also attached below is the interactive Wikiloc track for the Grandma Gatewood Trail section. Beautiful photos! There is a natural sandstone arch in Hocking County, the Rockbridge Nature Preserve. 100-feet long and spectacular. I looked at pictures. Amazing, and quite unlike anything in Utah. 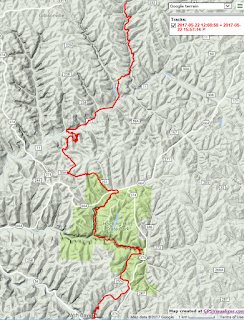 And it is so close to the Buckeye Trail. Wish I had known about it as I was passing by that area. I would have made a detour to see it.